Holy moly this has been a long road, but I am finally updating the renovation!! Okay! The great news is we are on budget!! Thats what happens when you live in the project, shop out everything, and do all the labor yourselves. However, this is one project that we don’t plan on repeating “this way” again. 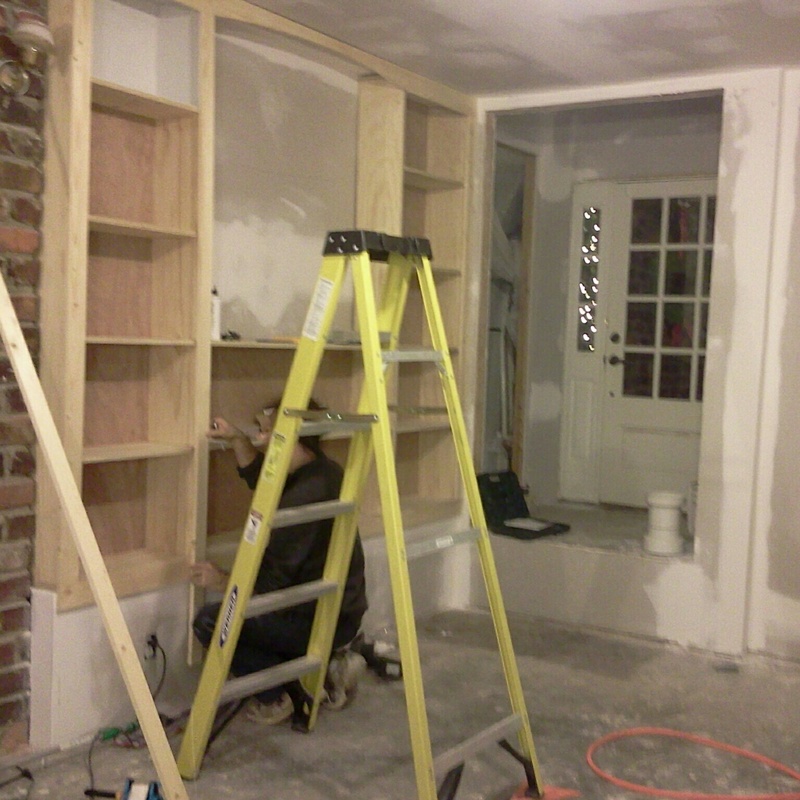 We really do love the renovations, but the extreme to which we are doing and living here is out of the question again. And that is Tim speaking mostly- not just me, his crazy wife. For him, since he does most of the labor, a home is hard when its also a job. The labor intensity of this house also caused a pretty serious physical injury for me, but now I am good to go! Anyway, we plan on more houses in the future …. just off site. Real estate is deep in our blood now! Anyway, our entire budget for the house is $10 to $15k. That includes a complete bathroom renovation down to the studs, same with the kitchen, and same with this “addition” we just finished. We spent $1000 on the bathroom and $3k on this room. We also had to put in an entire HVAC system. Tim put a very high efficiency system in for $2k. 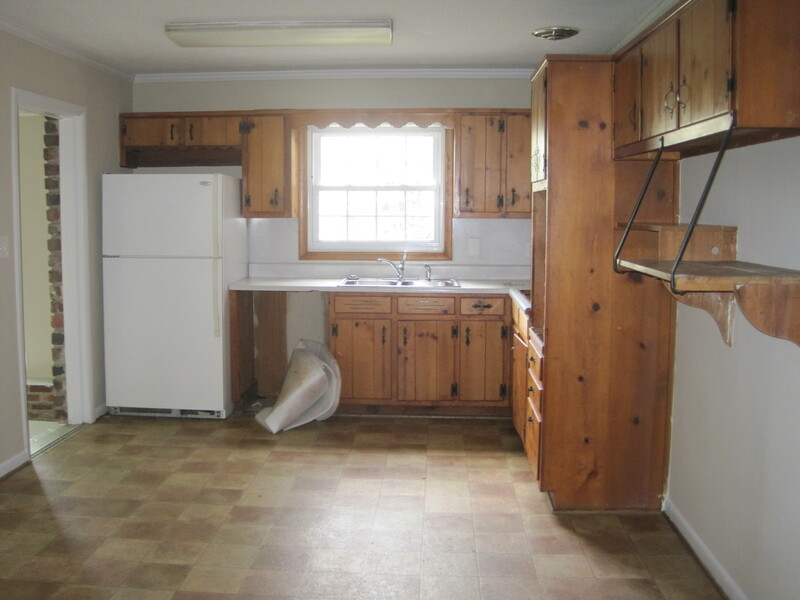 Our biggest expense is the kitchen that is left, but we are on track! Basically the dining room and bedrooms we are leaving alone. We did turn the old den into the new dining room. It will also have a small office space framed in that is just down from the bedrooms, so excited about that! 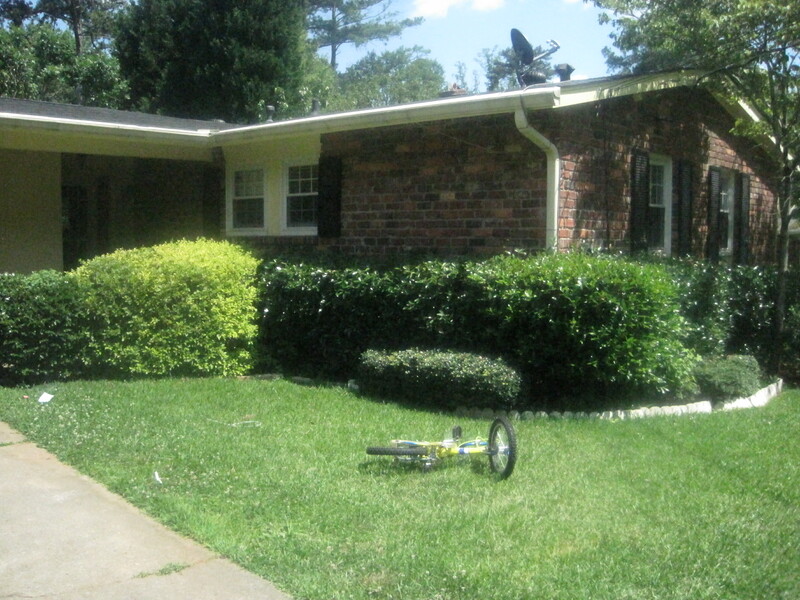 The picture you are looking at was the infamous “Addition” that was added onto the house…. and never finished, no telling how long ago. The fireplace is not real- its a heater with a mantle. 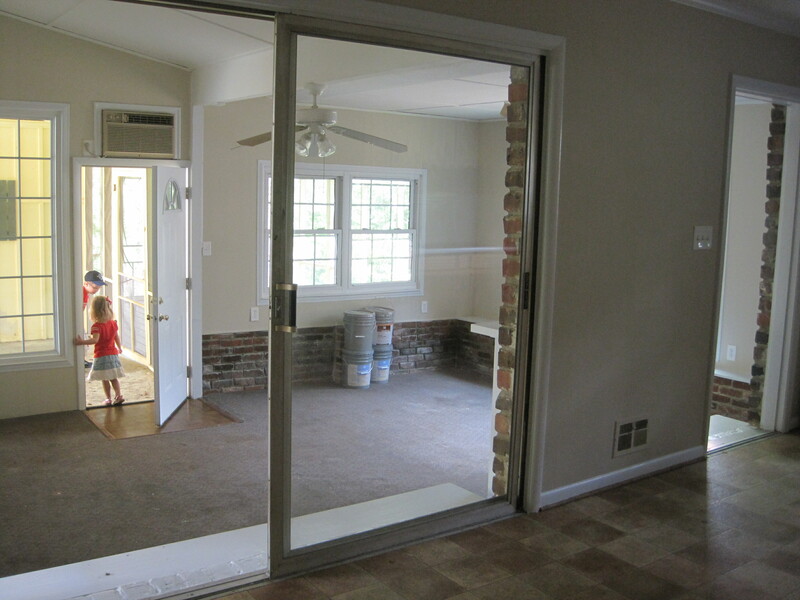 The sliding glass doors were classic in the middle of the house. The drywall was bad. The room had leaks and you could see outside through the cracks. It was an electrical nightmare. We ripped the room down to the studs and the floors down to the cement. 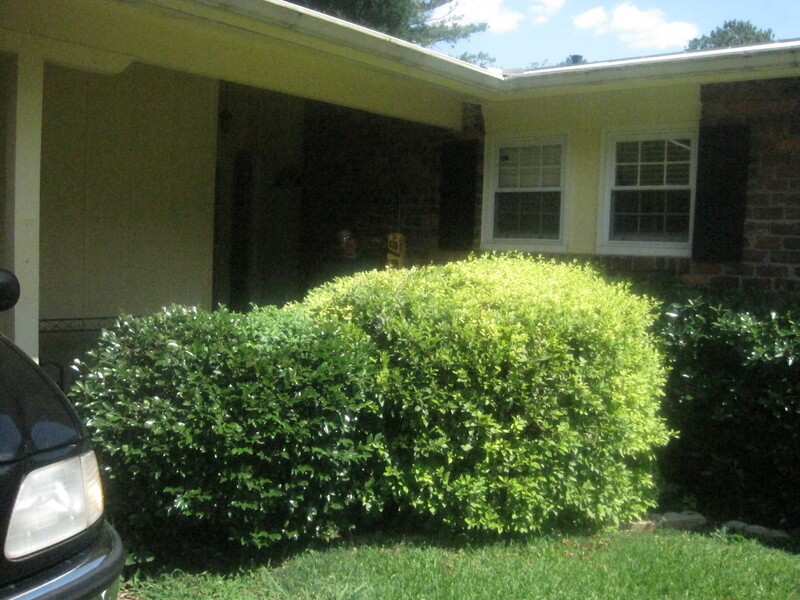 Here is the before… And yes, I sold everything you see on craigslist! Love to sell and love recycling. Here is a view standing in the kitchen looking down through the sliding glass doors. The door the kids are standing in was in the middle of the room… and there was a lovely HVAC window unit above the door, along with a massive window that looked into the garage. Because who doesn’t want windows that look into the garage?? Oh my. We ripped out the HVAC unit (before Tim had a heart attack), door, and massive window. 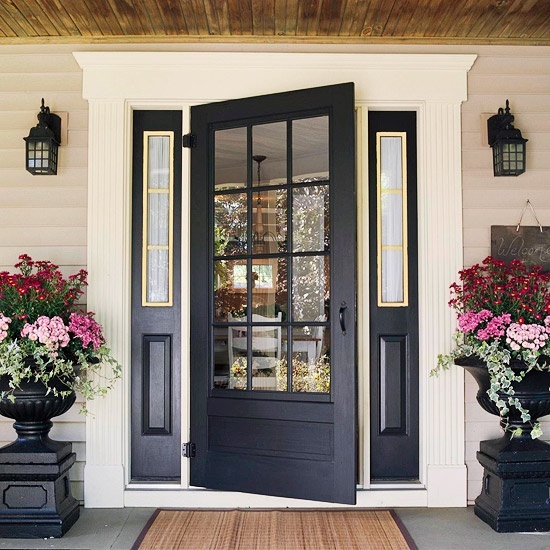 Instead, he made that double window into french doors that lead out to the cute little porch! 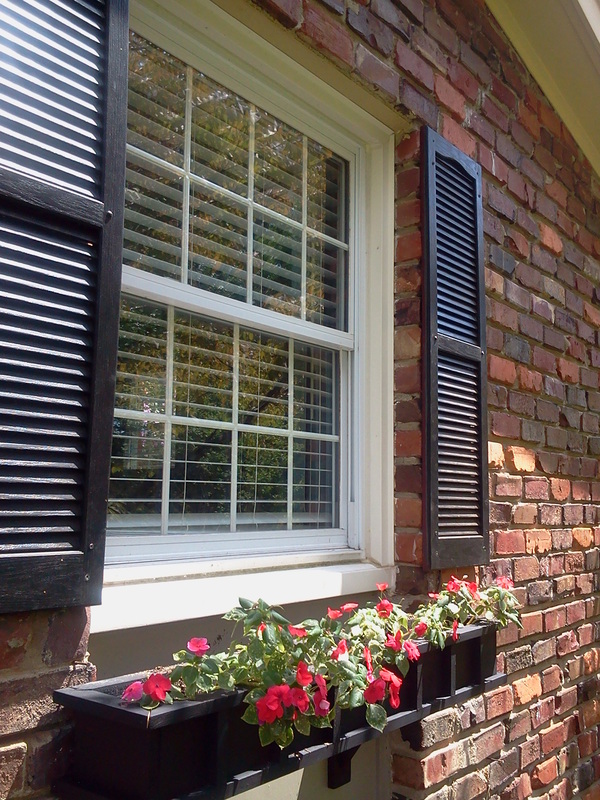 Those windows became french doors and he turned the other window into a cute sitting area with a window seat. This was the first exterior wall to come down. Bye bye garage window, door, and HVAC unit! And hello outside world! Next, we re-wired the whole room. Thank you John Weaver (and thank you Uncle Bob!) for the help again and knowledge you gave. The room also had zero insulation so this picture shows the new electrical and insulation. Also the framing for my window seat! Oh! And the floors- we ripped out the carpet, plywood, and scraped them smooth. Tim was very proud of himself for re-wiring this room!! Let there be light! Lord have mercy, this was a giant mess. Out went the wall, window, and brick!! Here is the lovely porch! There is something now laid back in me about when someone leaves the door open. It really doesn’t bother me anymore because… Hey! We had exterior walls down for small periods of time. Good times. This was getting it all sealed up and ready for drywall. 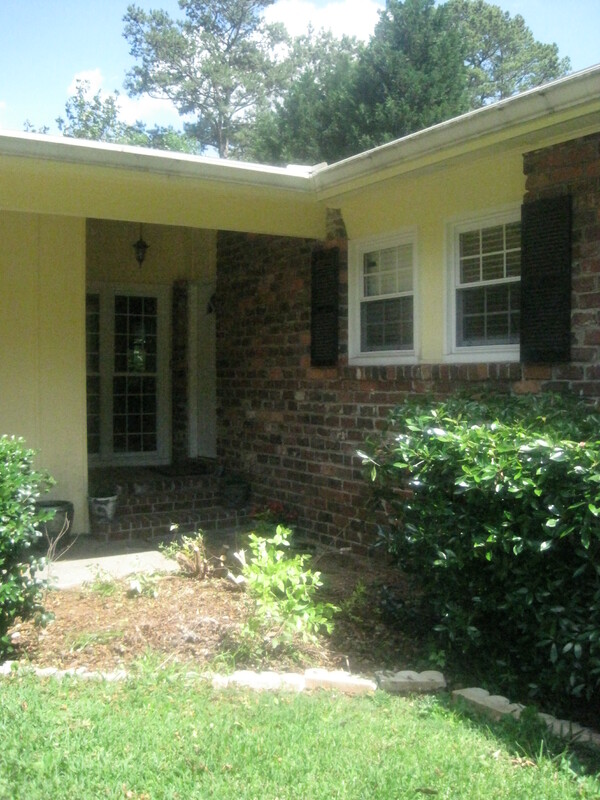 This is a shot of the sliding glass doors that were gone, yay! Also, to the right of them used to be the front door. 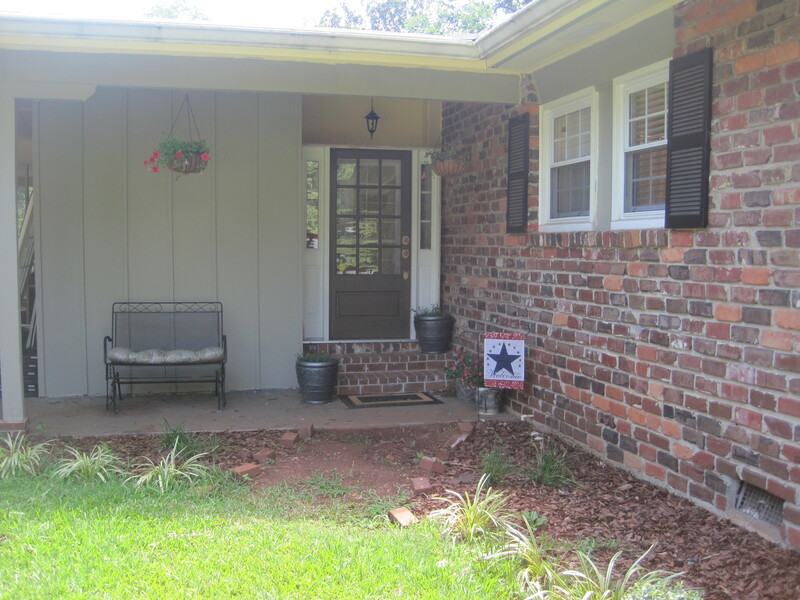 Tim re-worked the front of the house and made me a foyer and way prettier front door. 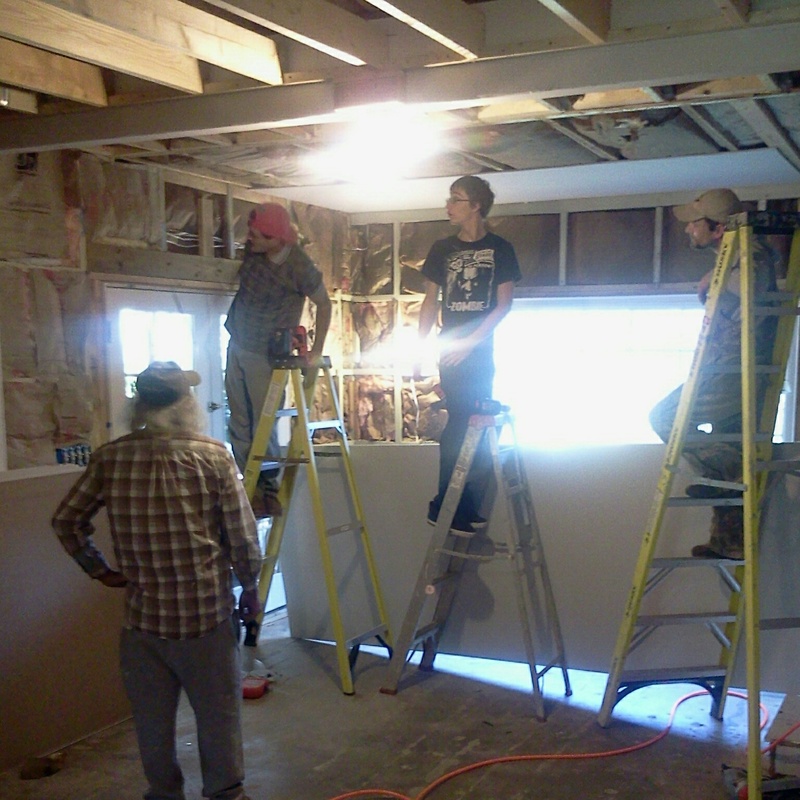 This is the drywall going in! Drywall up!! Sliding glass doors now a distant memory and ready for the new built ins Tim made me. 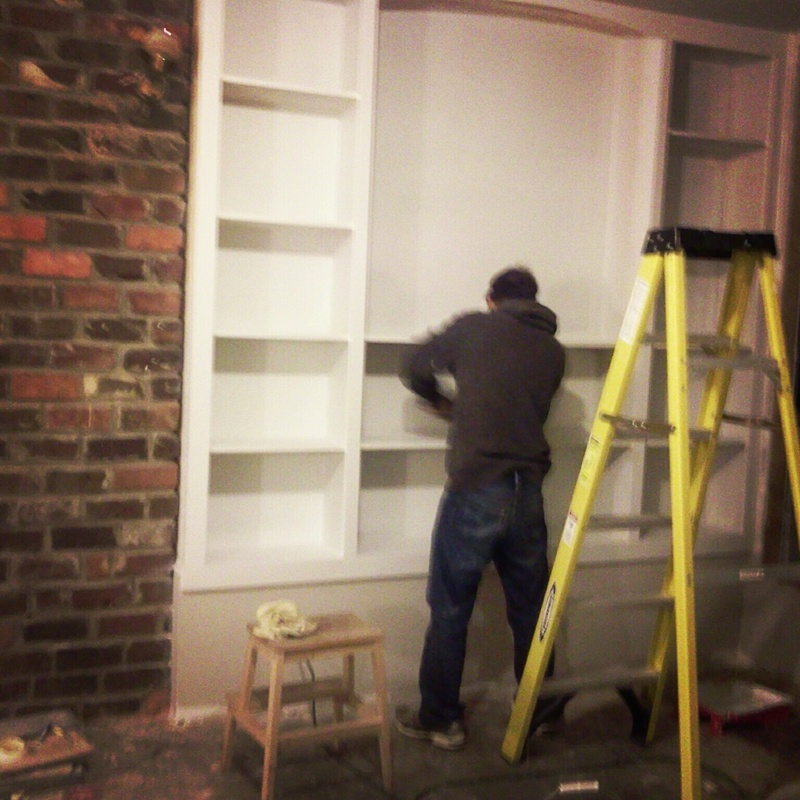 He has become quite the carpenter… Love this man. 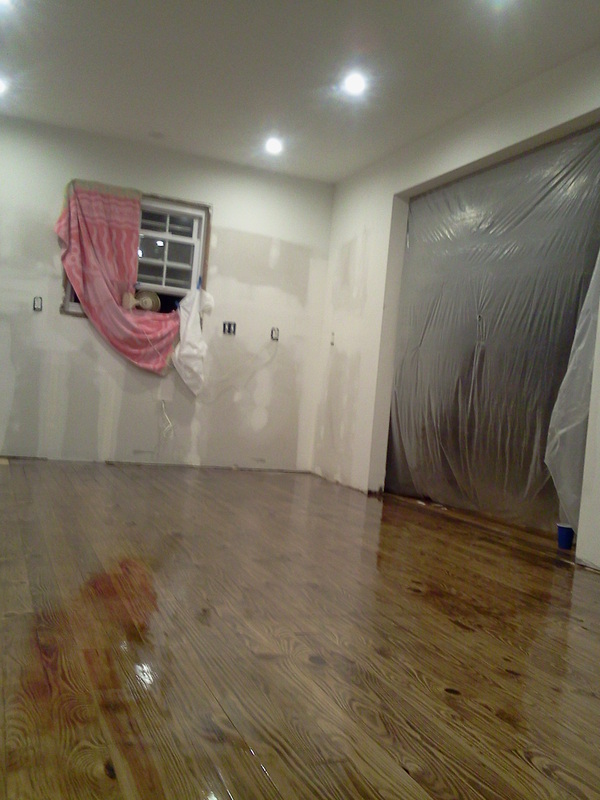 We then decided to stain the concrete floors ourselves! We cleaned, sanitized, and neutralized the concrete and then went to town! They turned out great and it only cost $80. 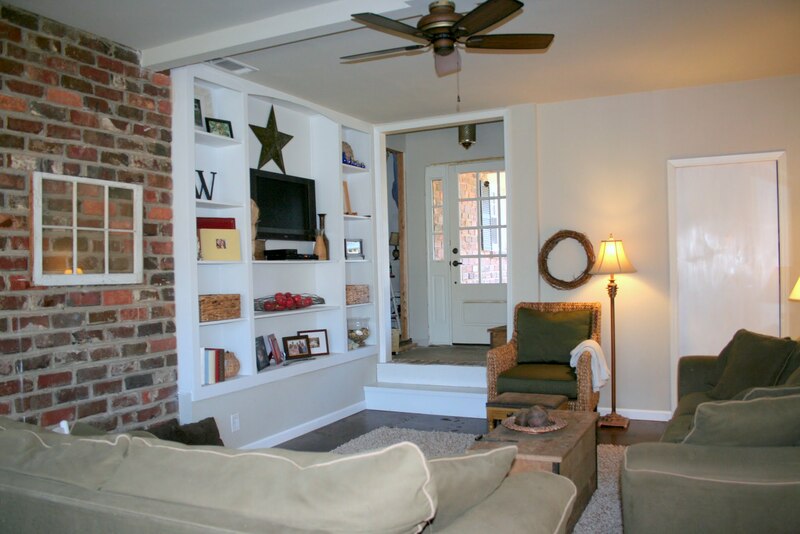 We kind of fell in love with the exposed brick so we are leaving it. 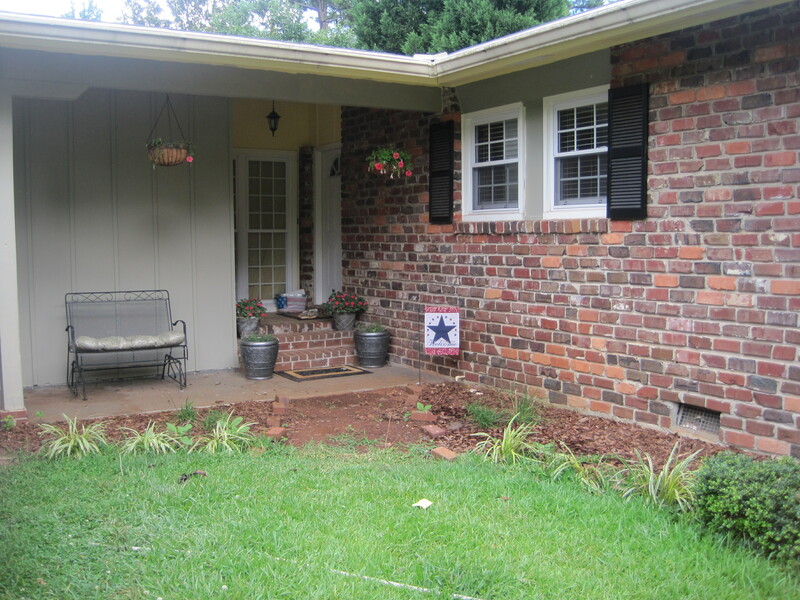 Here is the after shot of the addition!! 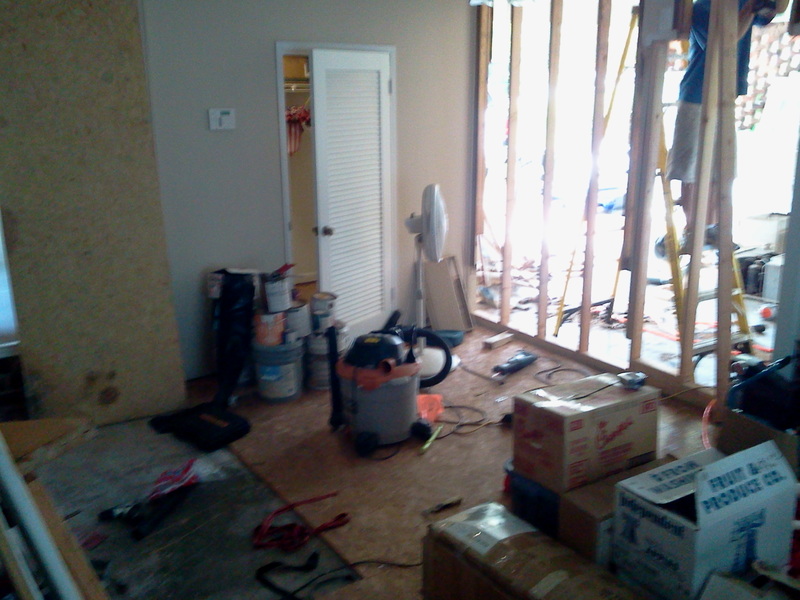 The hallway to the left of the front door leads to the kitchen (directly behind this room) and that is all currently being drywalled after we ripped all of that out. The doorway to the right goes to a mudroom Tim built me and has a door out to the garage! This room just flows and makes so much sense!! Something I thought would never happen!! 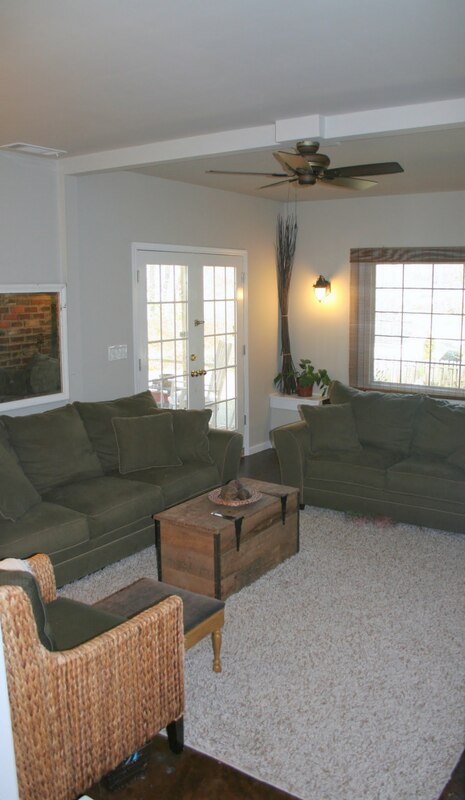 Different angle of the family room! No more window to the garage and no more door in the middle of the room! Loving the french doors with all the light that comes in. We can go straight outside to the screened-in porch that looks out to the backyard. 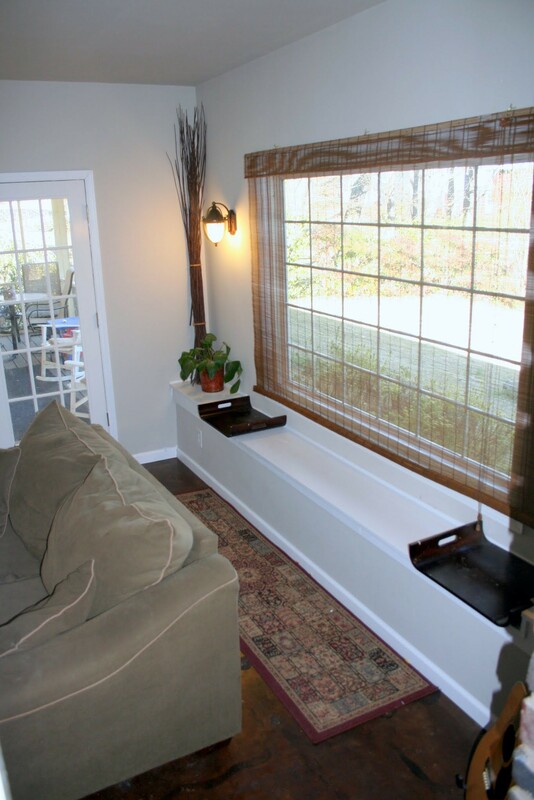 And really, really love the beautiful window and my window seat! The backyard is fenced so I can easily watch the kiddos from this room as well. The room is painted Sherwin Williams Accessible Beige. We mixed the paint up ourselves with my awesome mother in law! 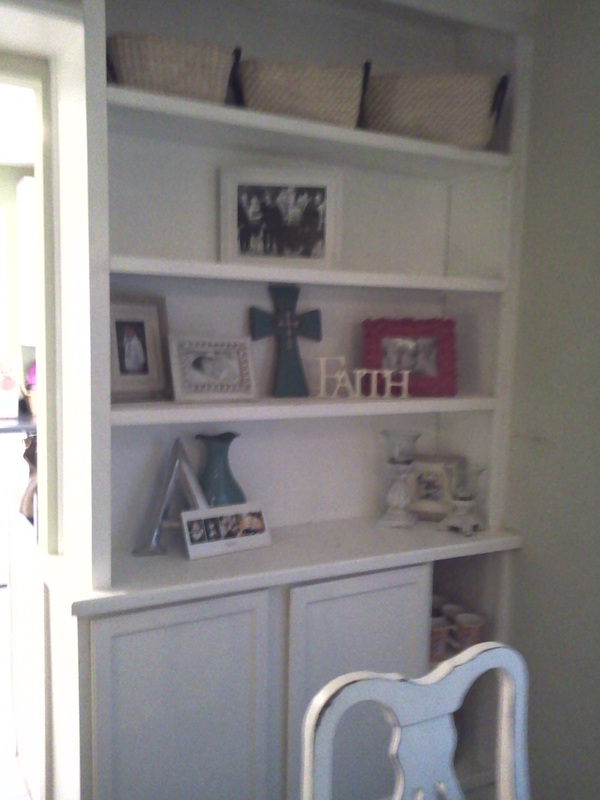 Would you believe I am still using all the paint we got off craigslist for $40 back at Nellie Mae? 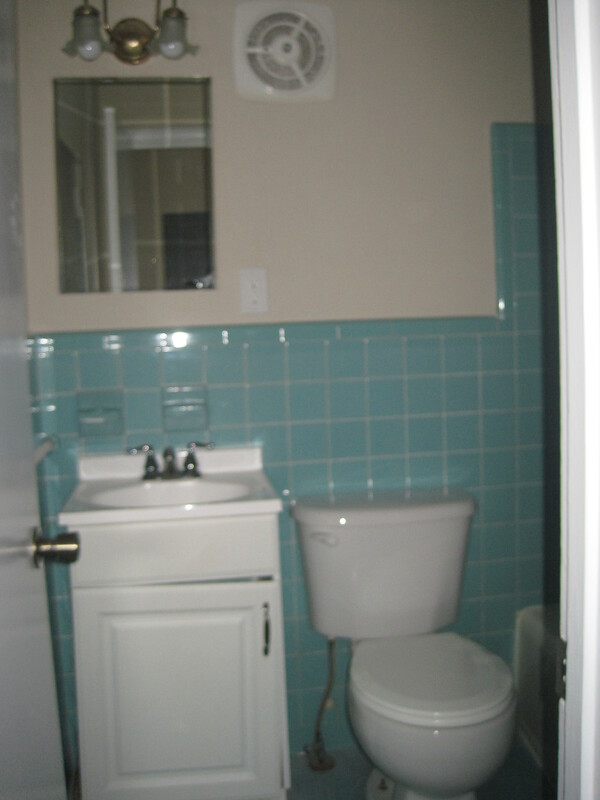 We haven’t spent any money on paint this project and I have painted a bathroom, 2 bedrooms, and the addition. Crazy! Kitchen should be done in a few weeks. I am going to post a walk thru video soon and also the blueprints Tims architect cousin did for the new floorplan! So thankful for family and friends and our sweet Lord that really does look after us every step of the way. When we literally have no strength left, He steps in and has given us the passion and energy for our eachother, our children, this home, and ultimately our dreams. My sweet uncle Bob who was a retired electrician and was a huge part of Nellie Mae passed away suddenly this morning. 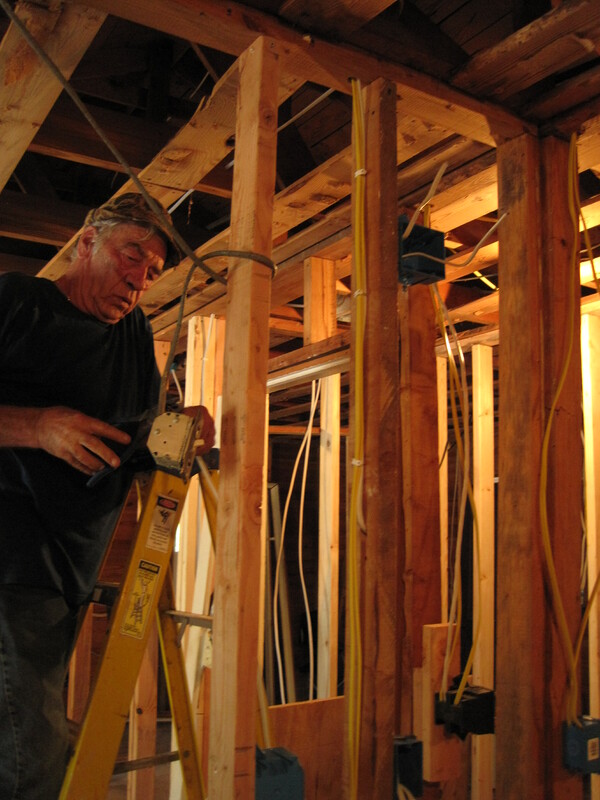 We grieve his loss… technically some would say he just wired our house, but he did way more than just wire our house. Bob gave his summer to get us into gear. He stepped in our lives at a time when a lot of people would have wanted to step out. You all saw Nellie Mae Pre-Renovation. Bob was there from the beginning with us and saw Nellie Mae at its worst. And well, he saw us at our worst. The days we told him about how Tim had lost his job. How we were starting over. How Tim was working, going to HVAC school, and renovating that darn house. How all our things were in storage. How nothing we did have in storage was going to fit into Nellie Mae anyway. Bob would listen. Offer advice. But mostly, he was just there. He just wanted to be there. And keep us focused on what needed to be done. Day to day. I owe Bob so much. On days I knew Tim wanted to just roll over and not move forward… because it was so hard to move forward… Tim would say, “Bob is going to be at Nellie Mae in 30 minutes! And he is going to want coffee! I have to go!” Bob came over daily the mornings we were in the electrical phase. Without fail. He wanted nothing in return for helping us. Tim figured he could try to pay him in coffee, so every morning Starbucks would have the order ready. 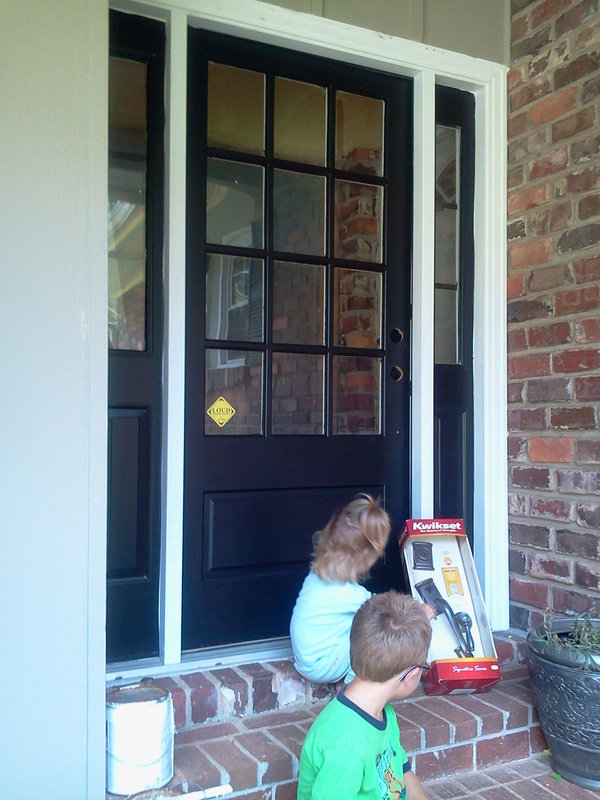 We also opened a home depot fuel points card for him hoping he would have eternal rewards with all of our purchases! Bob had a sweet spirit, a gentle and kind heart, and he just loved people. He was also there during a time of celebration with us. When we finished. When we celebrated at Stoney River. When Tim got the big job. And heard the news when we were ready to do it all over again! He was excited about our current house project and I am only sad that he won’t get to see it finished. Yes, he did more than wire our house. He was more than an uncle to me. He took us in like we were his very own. I have no question that Bob is sitting with Jesus right now because at a time in our life we needed Jesus the most…. Bob was a very clear reflection of Him to us. We love you Bob. 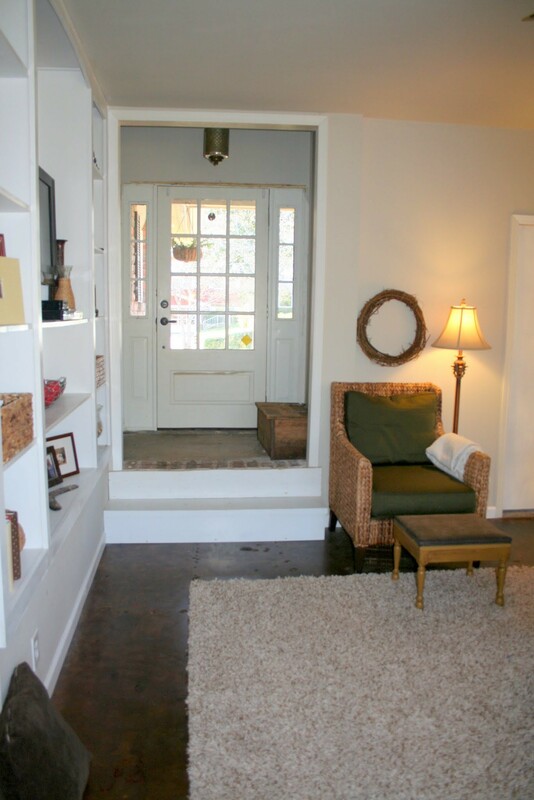 We also wanted to post pictures of Nellie Mae, Renter style… We had the most perfect sweet renter move in and it looks like a dollhouse. A young girl with a son are living here. 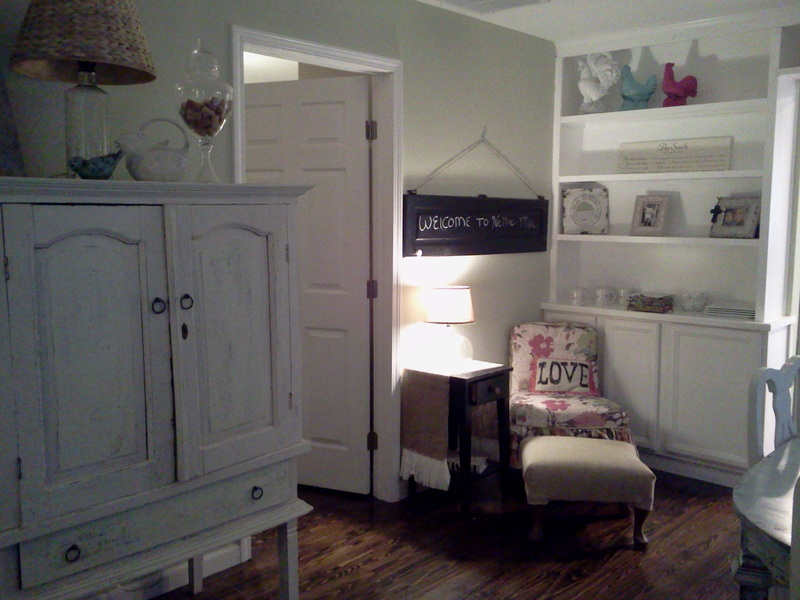 Her style is “shabby chic” and it is absolutely adorable. The house looks like it was made for her. With her permission, here are some pics. Thank you to Bob for not just making Nellie Mae a home and place of hope for us, but now for many that will reside there. I love that our renter has a sign on the wall that says, “Welcome to Nellie Mae”. Blessings are poured onto this house because it was built with so much love. 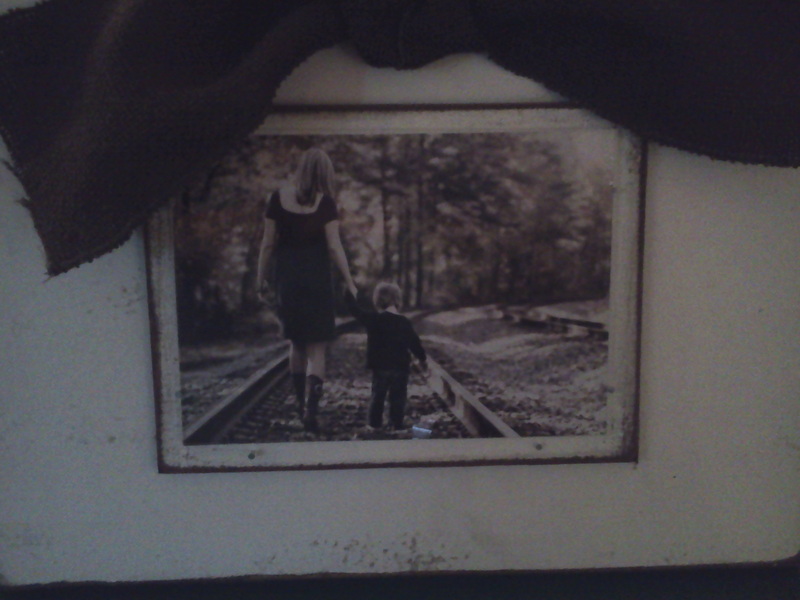 Our sweet renter and son. We found our way here…. and pray that many will too. 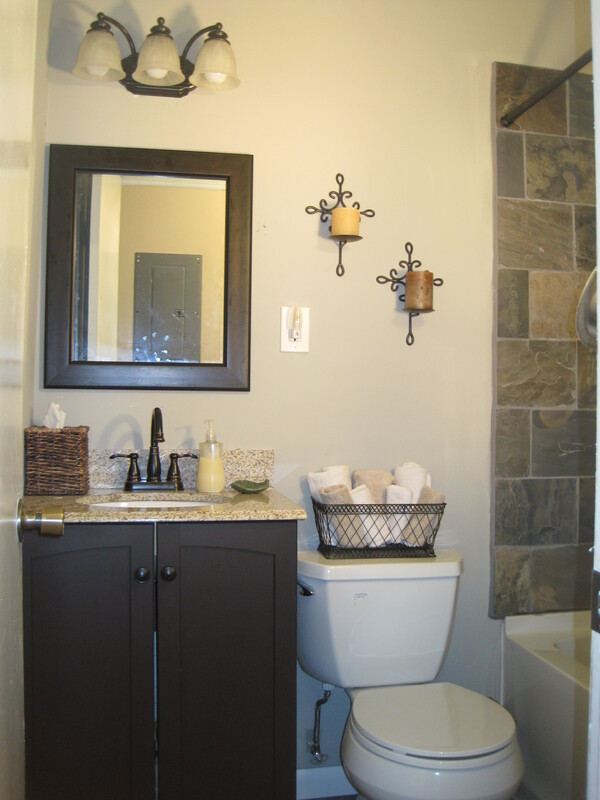 Well holy moly our bathroom is finally done!! The walls are grey to match the grey hairs we both probably have by now! No grey hairs yet, but this bathroom has seemed to DRAG along!! Mostly because this summer we moved 2 months ago, became landlords, Tim hit record hours with his job because of peak Heating and Air season, I took on a very part time job with Marietta Farmers Market, our oldest is about to start kindergarten, and we like to feel like we have a life outside of renovating a house!! The depth of details was a pretty big deal this go around. Never underestimate the amount of time that demolition takes. It is a huge factor that requires a lot of time, clean-up, and preparation. 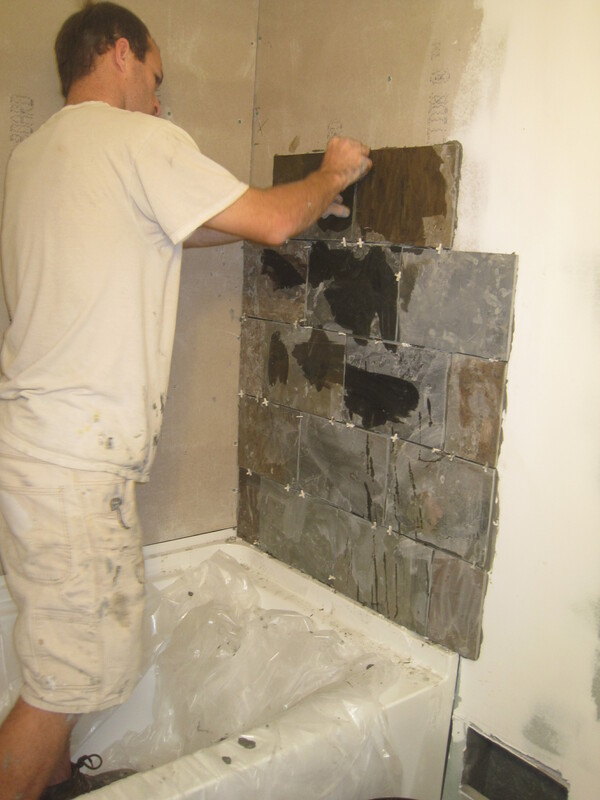 When you hang slate, there is a sealer you have to apply, wait, then grout, and then seal everything again. 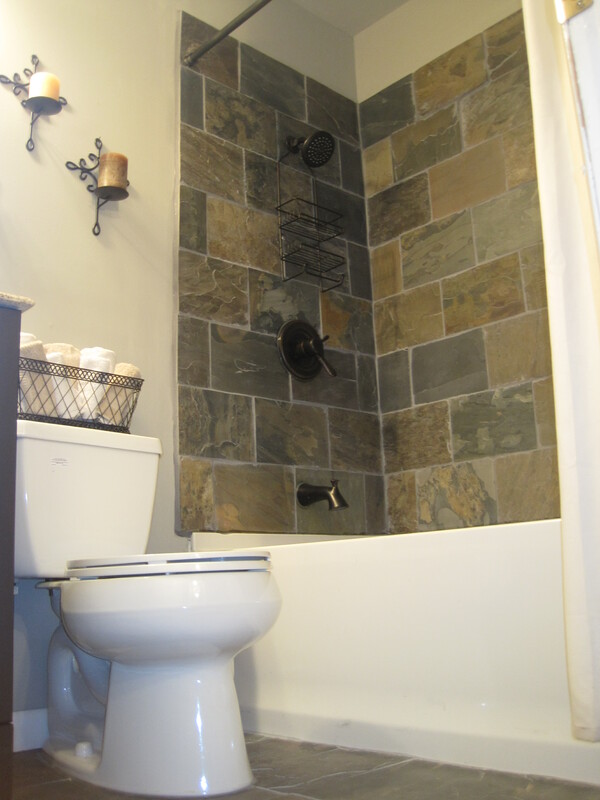 I hand picked every piece of slate in the order we hung it so that it would look random, but still flow together. 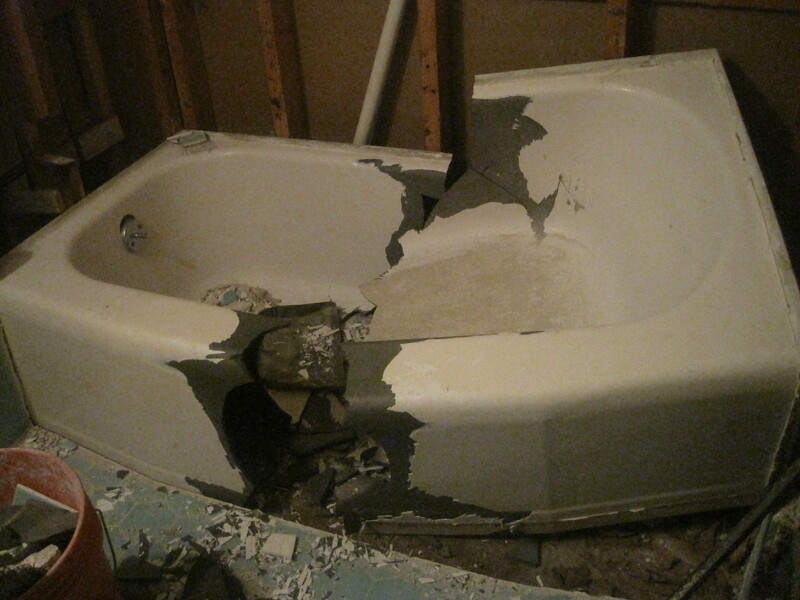 We cemented the underneath side of the bathtub which is a really neat way to stabilize it so it feels really solid. 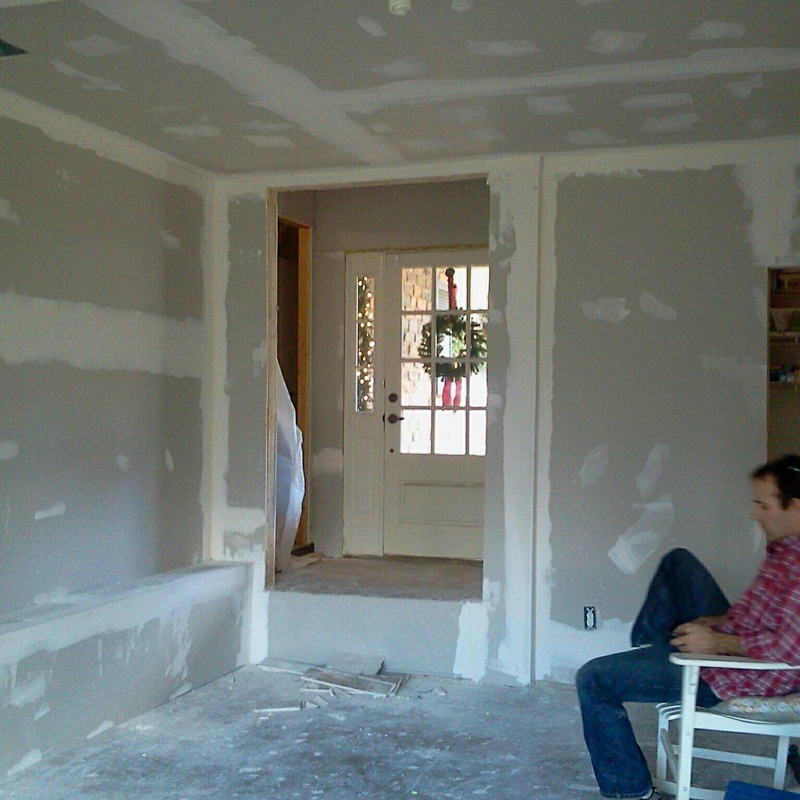 Tim watched drywall videos on You Tube and that was a tough job. It turned out great, but we will stick to hiring that out for future projects because of the time it takes. Drywall really does take extreme skill because you can tell if it looks crappy! 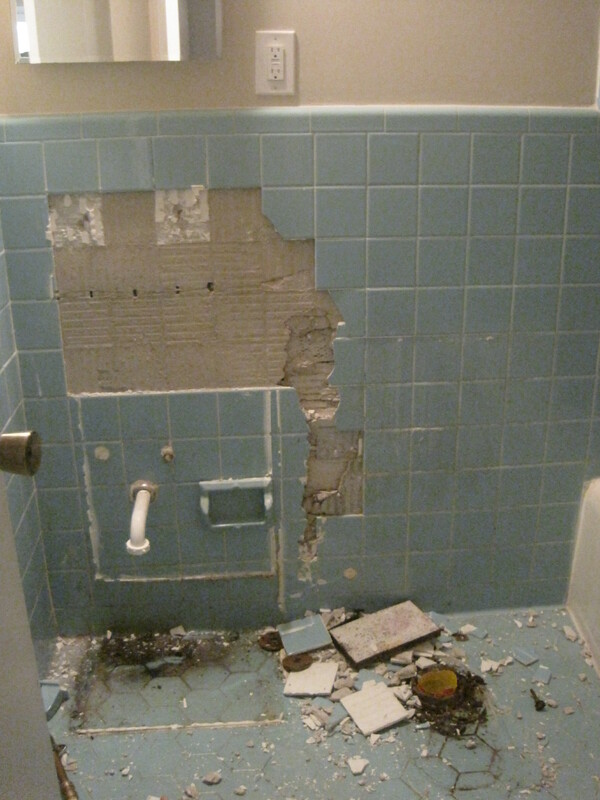 In most cases, other than a small space or repairs, hire it out!! Either way, an hour here, an hour there, a few hours on the weekend…. and BOOM! The bathroom is complete!! We were a little discouraged we were thinking we would hit right at $750 for the bathroom, but it came in right under $1000.00. 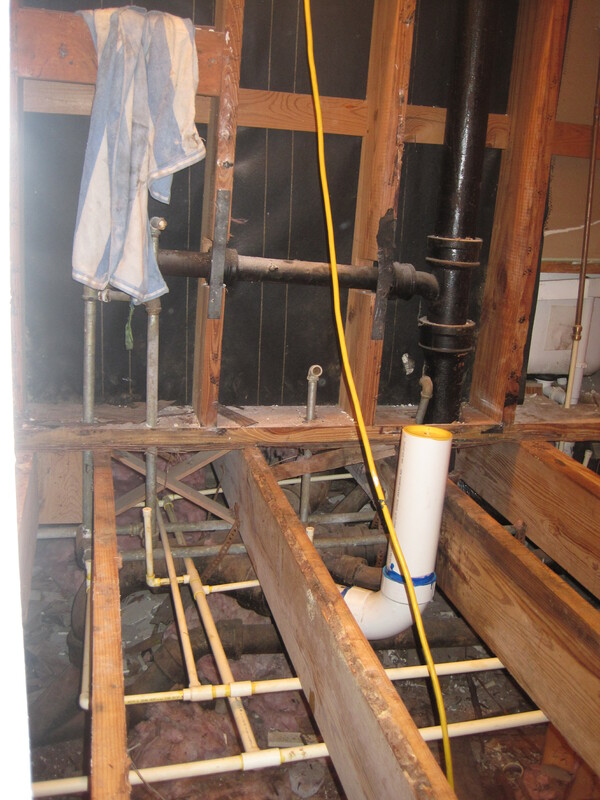 I know all in all that is pretty good for a brand new high end bathroom, but plumbing was expensive. I will start a budget breakdown but the $1000.00 included: New studs and sub-floor, wonderboard, drywall, new plumbing for sink, toilet, and shower. New electrical for lights, outlets, and vent fan. 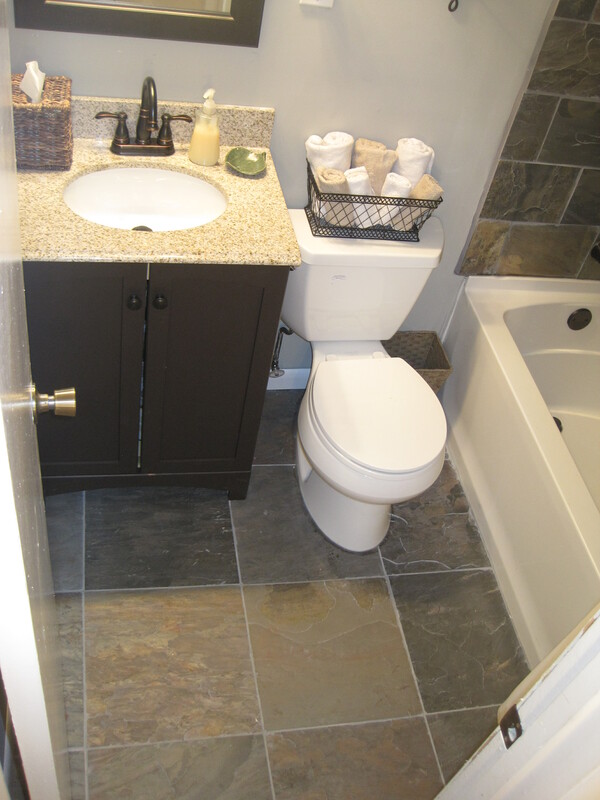 Vanity with granite, slate floors and shower, all Kohler appliances, and Venetian Bronze Delta hardware for everything. We are very in love with it. And very grateful it. 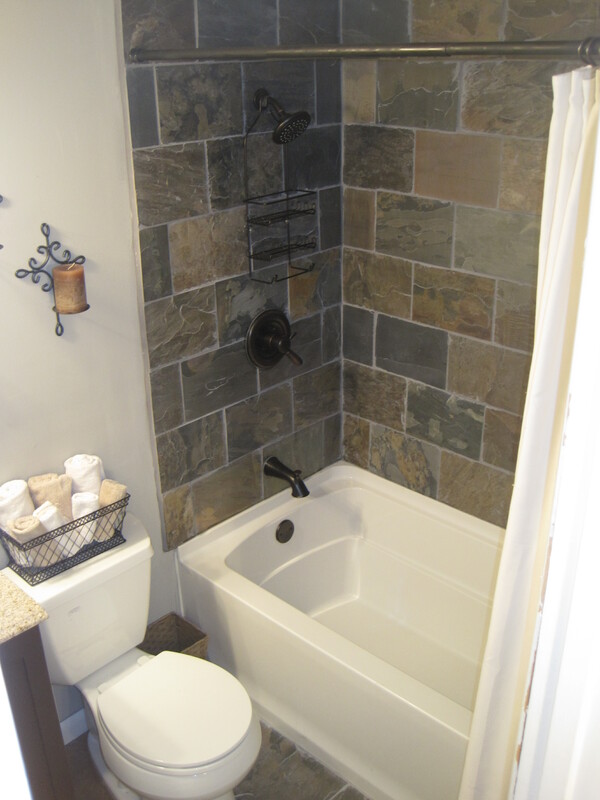 The slate looks incredible, I love the wall color, and the dark venetian bronze matches some of the flecks of granite. Ahhh! 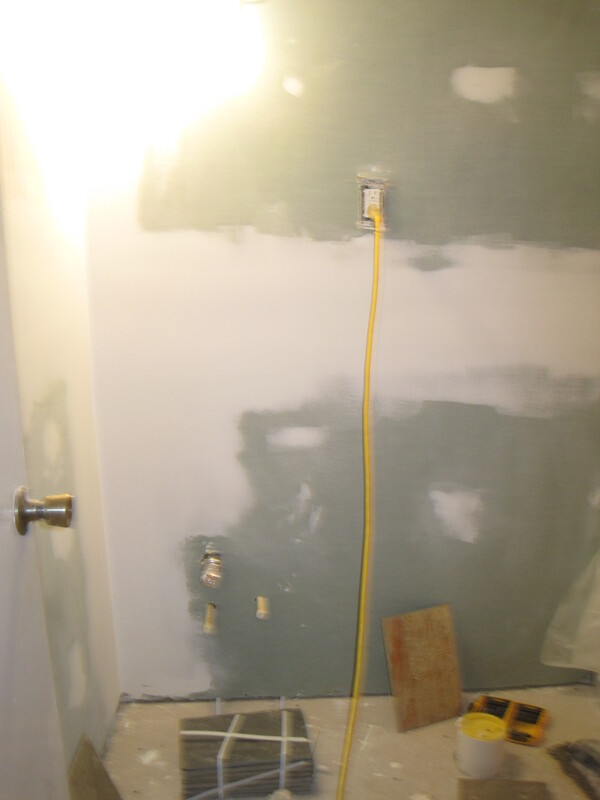 You saw what it came from, so needless to say… we are excited to actually enjoy showering here =) It was really fun to do an expensive renovation as well. We actually have no idea what the exact value we added was, but we think it would have cost a normal person around $5000.00 – $7000.00 turn-key. Our next project is the entrance to the house and the addition. 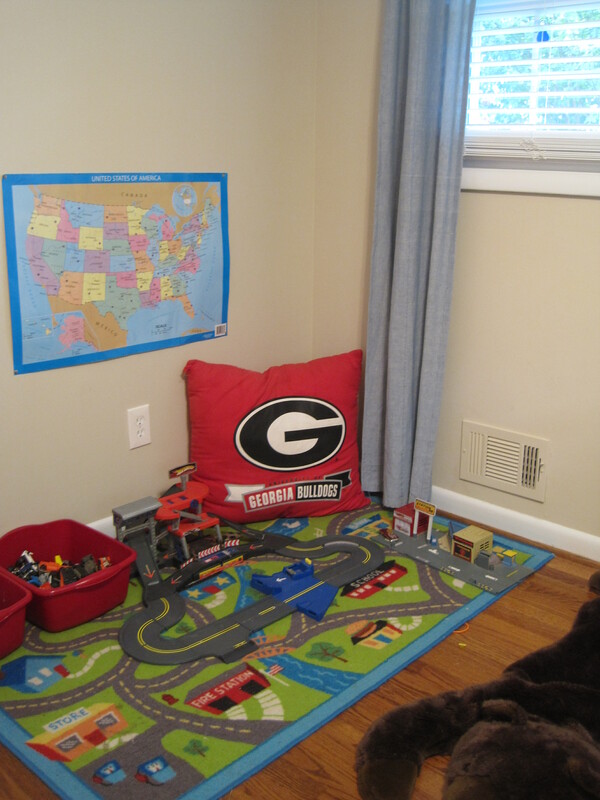 What is it like having an almost 6 year boy old in the house? Well, anything related to boats, bugs, and beemers and you have his full attention. *Note: we do not own a beemer, but somehow our son was born knowing about them and wants one. Anyway, we had to incorporate all those things into one room. He also has a huge spiderman tent that he prefers to be up at all times in the middle of the room. I did take it down for the photo shoot. I bought for this rug from Pier 1 on clearance and with a 20% off coupon it was $43. 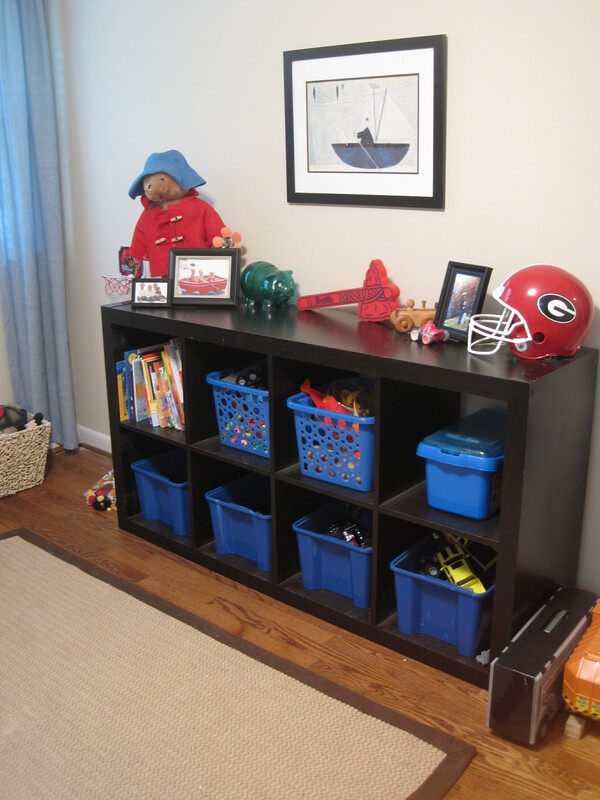 I also bought the shelf above his bed from a yard sale months back for $5. The nightstand was from Goodwill for $15 that I refinished. Baskets are from Target on clearance, $5 and $10. 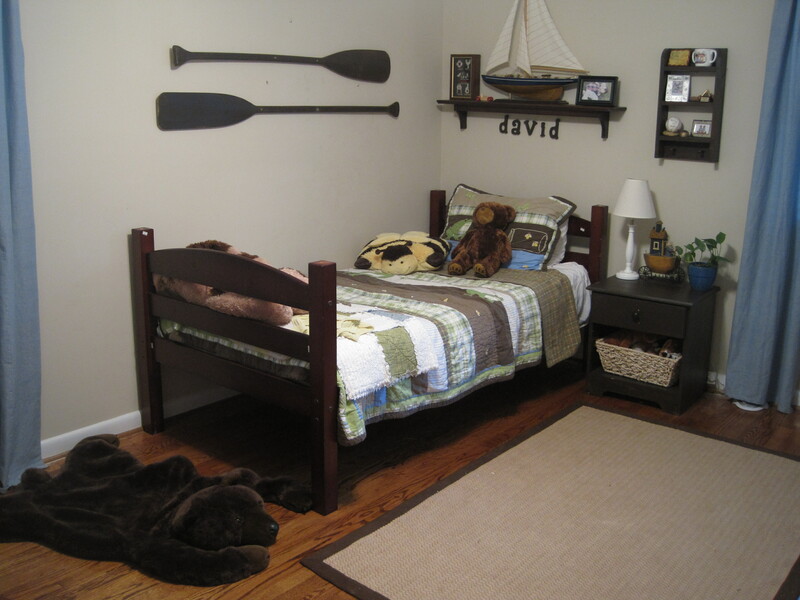 His bedding is the boy version of Mackenzie’s quilt set also on clearance at Target, $40 for each of their quilt sets. I had the Ikea cube shelf already as well as the curtains from Ikea. The paddles are from Tim’s old canoe. Ask Tim about what happened to his canoe sometime. I’ll give you a hint. He went down some rapids with it. Anyways, he told me I could have the paddles. So I painted them and drilled holes through them into the wall…. we don’t want paddles falling off the walls now do we?!? David is pretty happy. 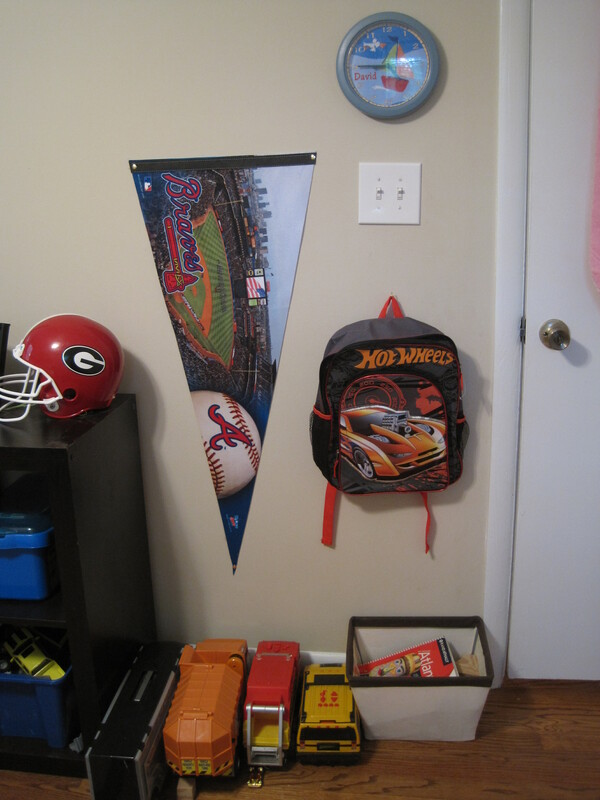 Since he will be a rising little kindergartener, we threw in the map and a place to hang his back-pack! (1 of the 5 backpacks he thinks he has to have on a rotation). 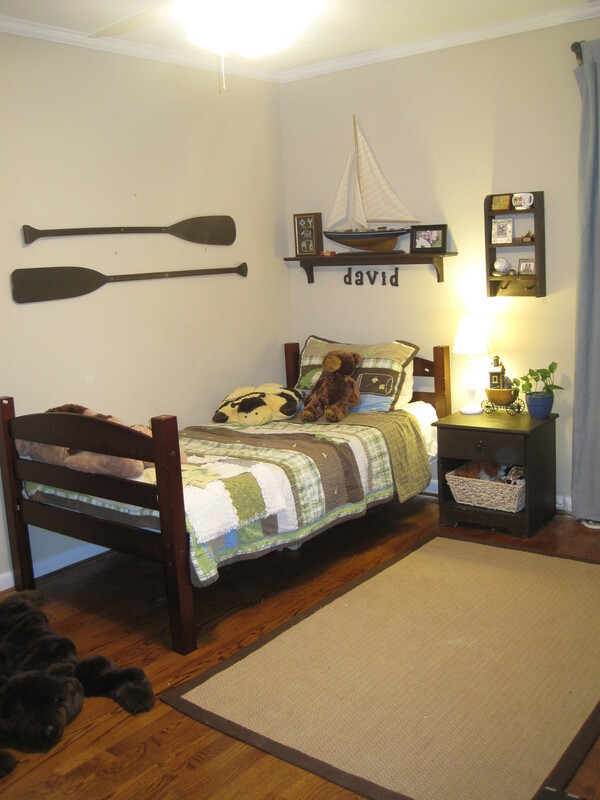 Here is little man’s room! And, what do normal couples do on a date night? Dinner? Movie? Romantic Getaway? 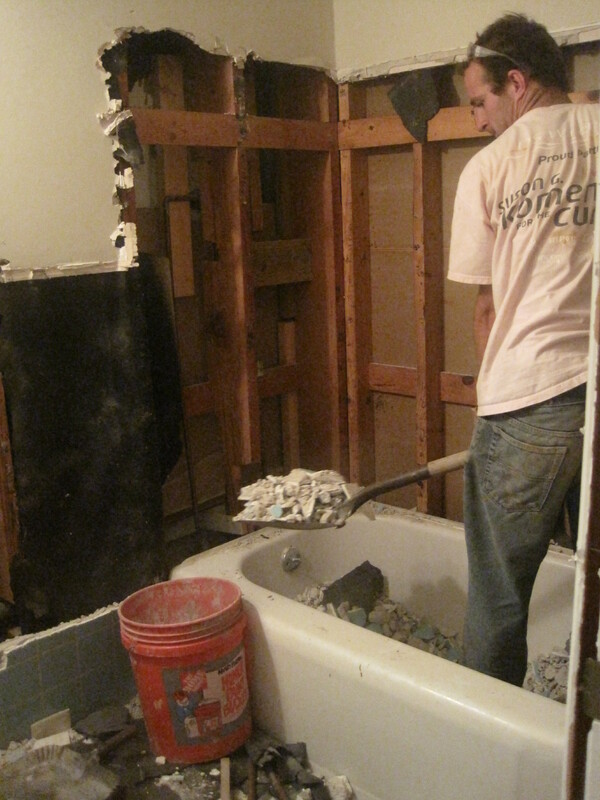 Well, over here in Renovation Land, we are going to finish the bathroom while our 2 little ones go to grandmas overnight! Laying slate, spreading grout, and getting our new bathroom in will be a huge step forward in this project being one step closer to DONE! We still have a huge section of the house that is not live-able. The “addition” is our next demo and restore phase. It includes re-arranging the floorplan and a new front door. 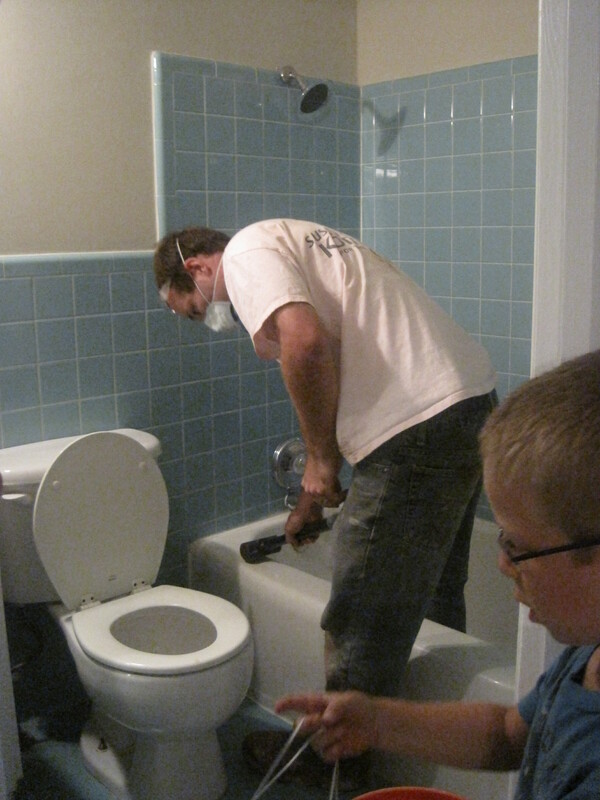 We wanted at least one of the bathrooms to be finished before we did that. 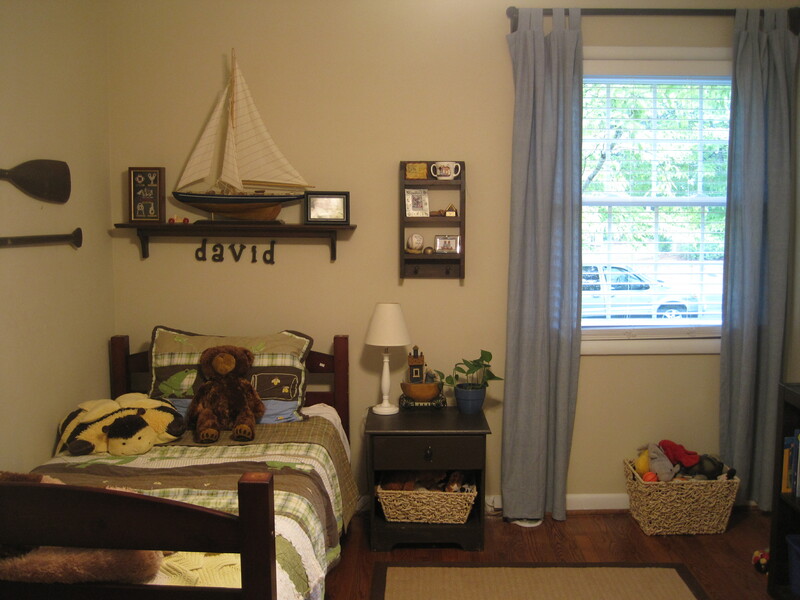 Rooms that are done so far: Family Room, Mackenzie’s room, David’s room, and almost the bathroom. Rooms liveable, but not how we want them: Master bedroom and bathroom and Kitchen. 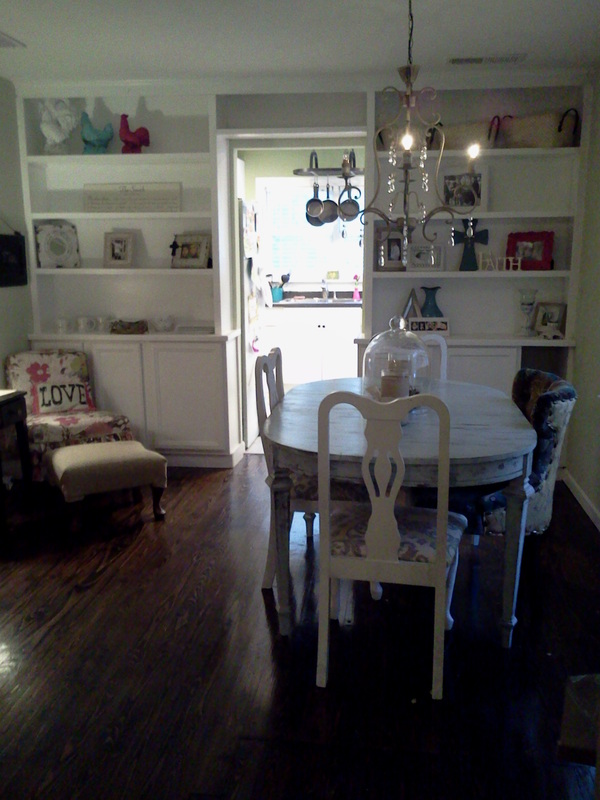 Rooms completely out of order and not functioning- everything in the addition- dining room, sitting area, & mud-room. 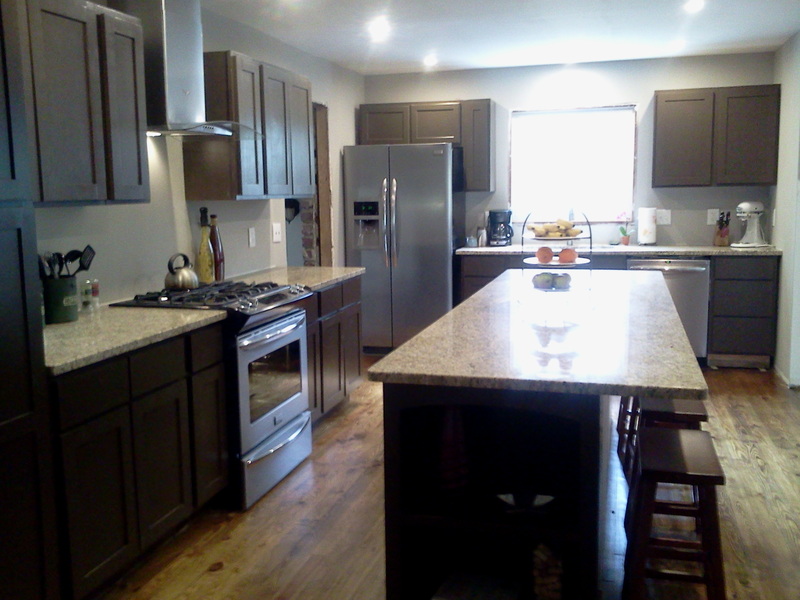 After the addition is finished, kitchen and master bath will be last. We are planning on being completely done by Christmas and we are on budget so far, come on Hope House!! !